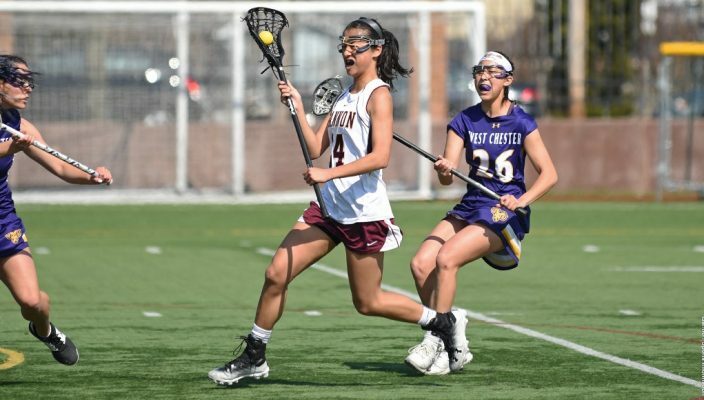 The Gannon University women’s lacrosse team lost 21-3 to the visiting No. 7 West Chester Golden Rams Saturday at McConnell Family Stadium in a Pennsylvania State Athletic Conference matchup. Neither team was able to score until five minutes into the game when Sami Barnett put the first points on the board for the Rams. Kayla Shields was quick to respond for the Knights and tied the game at 1-1in less than a minute. West Chester’s Tatum Altman broke the tie a minute later, assisted by Taylor Baud. The Rams continued to put their offense to work, scoring eight unanswered goals before Gannon could respond. With 10 minutes left in the opening half, Gannon’s Erin Rotondo scored twice to set the score at 9-3 in favor of West Chester. Rotondo was unassisted in both goals. But the Rams scored three goals in the last five minutes of the half to go up 12-3. West Chester controlled the second half, putting up nine more goals and holding the Knights scoreless. Gannon goalkeeper Erin Renwick stopped 12 of the 33 shots on goal she faced. West Chester rotated goalkeepers at half, switching Julianne Clemens for Nicole Martins. Clemens stopped one shot and let in three and Martins recorded one save. Rotondo’s two goals and Shields’ goal accounted for the Knights’ only scores. Ryan McKinney, Tara Morrisey and Emily Schulze had three goals each for the Rams. West Chester had four players with two goals: Altman, Devon Mela, Barnett and Alex Wendig. The Knights are still looking for their first win in the PSAC, having dropped their first six. Gannon’s overall record is 2-8. With the win, West Chester improved to 5-1 in conference and 9-2 overall. The No. 7 ranked Rams are a game behind No. 9 East Stroudsburg. Gannon will be back in action Wednesday when the team travels to Indiana University of Pennsylvania for a 4 p.m. start. The Knights will also travel to East Stroudsburg for a noon match Saturday. Gannon’s next home game will be at 4 p.m. Tuesday against Seton Hill at McConnell Family Stadium.